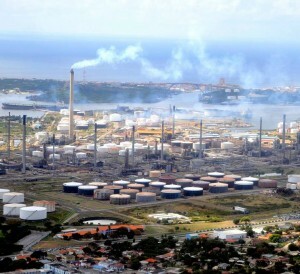 WILLEMSTAD - After years of living under a haze of waste gases from the Isla oil refinery in the middle of Willemstad, residents now also have to deal with a strange green substance covering the Wishi neighborhood. The strange green substance showed up a few months ago, the Dutch TV station NOS reports. The residents have no idea what this substance is and are demanding clarification from the authorities. Almost every lamppost, fence and mailbox in the area has turned green on the side of the refinery. Isla has not responded to calls from the residents for an explanation on what it is. Peter van Leeuwen of the environmental group SMOC took it upon himself to find out. He took samples of the substance to TNO in the Netherlands to have it examined. “It is nickel-containing, carcinogenic compounds and vanadium. These are heavy metals, so carcinogenic.” he said to NOS. “Test results indicate that Isla spits out three to four times more debris than a year ago.” Emissions of vanadium pentoxide, which is partly responsible for the green substance, is the result of Isla refining heavier oil, according to Van Leeuwen. The residents of Wishi and SMOC are not only looking to the government, but also to the Netherlands, for help with this issue. They believe that the Netherlands should tell Curaçao to act against Isla.